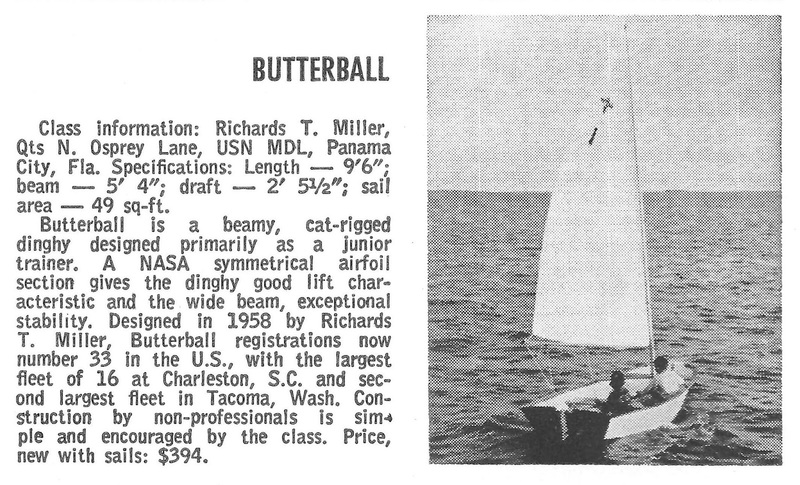 In my continuing series on home-built sailing dinghy classes from the 1960's, as featured in the One Design and Offshore Yachtsman magazine, here is the Butterball, a 9 1/2 foot pram with dory like sides presenting a very large beam for this size boat. 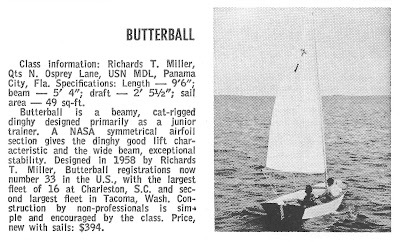 I've never seen one in the flesh (unfortunate choice for a class name - I wonder if this was before Butterball was associated with Thanksgiving turkey?). I doubt this class never made it much past the 1970's but as with most of these classes there is probably one or two who exist in the present day. Leave a comment if you've seen one or have any more information. 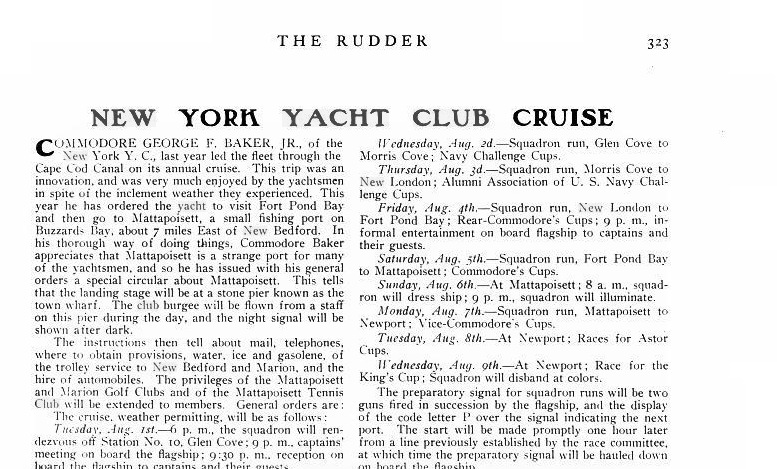 "In the summer of 1958 Captain Richard T. Miller, of the Ship Design Division, Bureau of Ships, U.S.N., who lives in Annapolis, Maryland, de- signed the 9'6'^ Butterball pram dinghy as a junior training boat. The most distinctive feature of the class is said to be a thick (1'%'') daggerboard with a symmetrical airfoil section. This is said to give the boat a good lift, so that she sails close to the wind and balances nicely. The designer reports that Bob Bavier (Yachting) sailed Number 1 boat in the spring of 1959 and appeared pleased with its handling qualities. 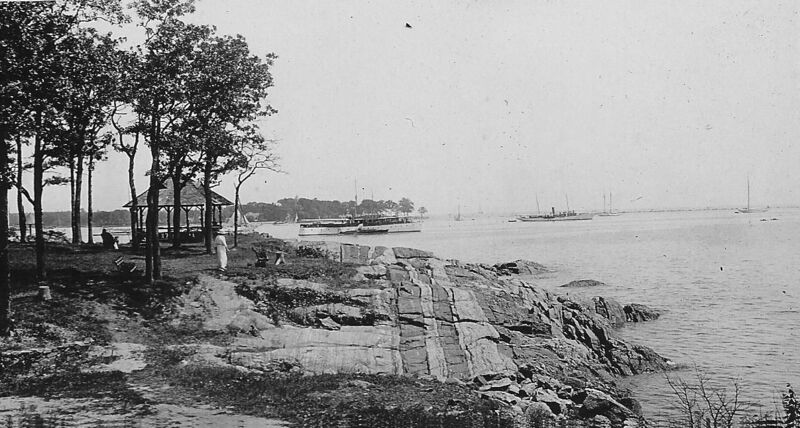 Of the thirty boats so far built, most of them are located in the vicinity of Charleston, South Carolina; some are at Tacoma, Washington; others are in Texas, Michigan, Missouri, Australia, and New Zealand. Material is mahogany plywood. Captain R. T. Miller (R.F.D. 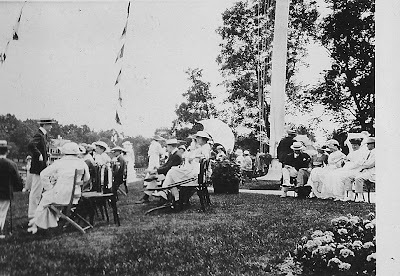 3, Box 392, Melvin Rd., Annapolis, Md. ) is the source of information on the class. 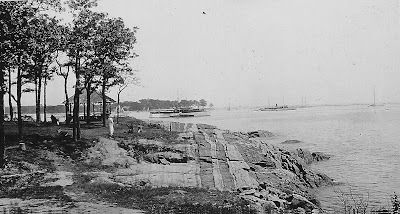 The principal builder is Bill Dodds Boats (Route 1, Box 156A, Johns Island, S.C.). 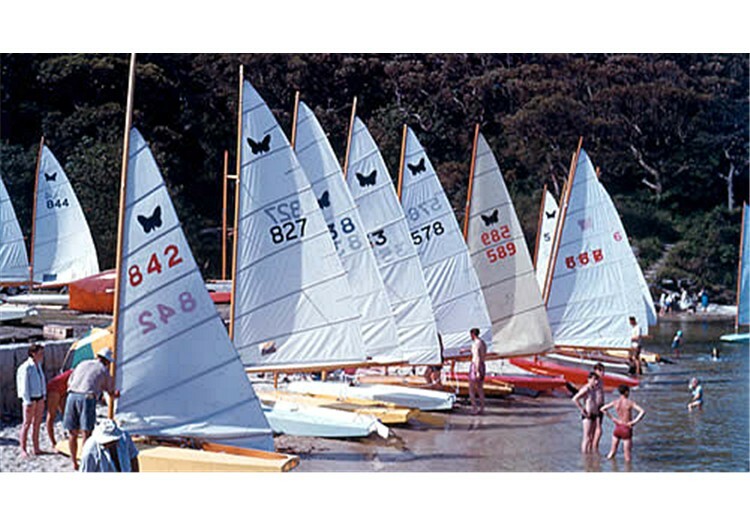 The price is about $400 new, one of the least expensive sailing dinghies of which we have heard. VITAL statistics: L.O.A. 9'6"; draft without centerboard 5", with C.B. 2'$^"; sail area 49 sq. ft.; weight 150 lbs. ; trailable or cartop. 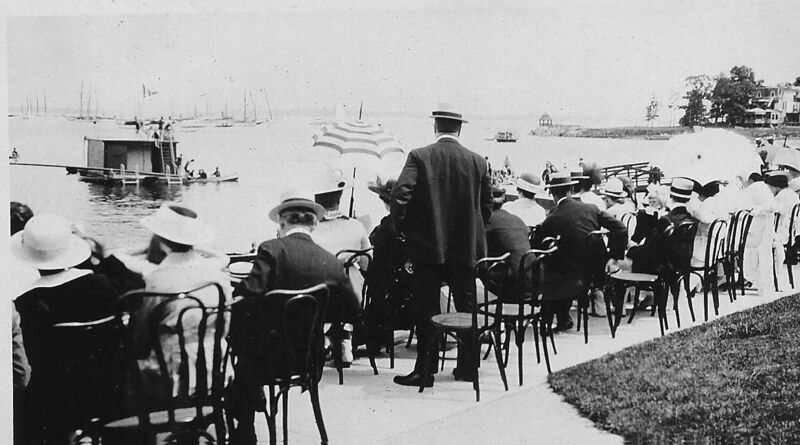 America's Cup: What? You agree with Me? In my previous post about the America's Cup, I opined that the AC 72 was much too big and it appears someone else agrees with me. Coutts, 51 said before the accident that his team's decision in 2010 to use 72-footers for the Cup was a mistake. He believed then that the 72s would look better on TV than smaller cats which are less costly to build and slower. Coutts later discovered during the televised America's Cup World Series beginning in 2011 that 45-foot cats played well on the screen. "We were paranoid this needed to look good on TV," Coutts says. "I thought the 45 would look too small. It doesn't. It looks fine." Oh-oh! Not good when you admit you are probably sailing the wrong boats before the series even starts. For more unbiased America's Cup reporting, I suggest you follow either Tillerman, or Joe over at Horse's Mouth. If some of you young'uns are contemplating a career as a sail-race professional, I suggest you start concentrating on getting some trampoline combined with Rubik's Cube workouts, as the link to this following America's Cup training video shows. Continuing on one of the common threads throughout this blog, that being all things scow related, I've dug into my photo archive to post some photos of the Aussie scow Moth. The Aussie scow Moth is a particular favorite of mine since I owned one for several years and dragged it out to race once a year at Brigantine N.J. Back then George A. had a start for "All things Moth but not a U.S. Classic Moth" and I and the scow suffered through some miserable light air performances to get a chance in some breeze. 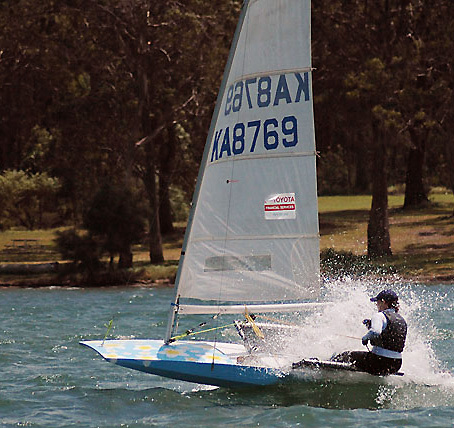 I wrote about my Aussie scow here. Oztayls (This has got to be mnemonic for something - don't know what though? Aussie Tales?) has started a blog about his restoration of one of the later designs of Aussie scow. 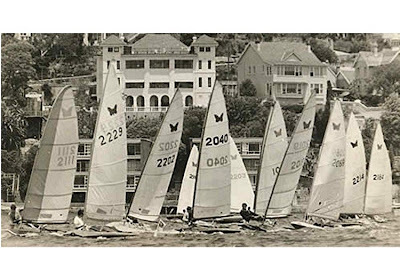 Here is a early picture, probably mid 50's since they all look like variations of the original Len Morris single chine model and sport wooden masts. I'm guessing one of the clubs around Sydney. Again, Sydney Harbor, though later, a start in the 1960's. The scow on the left sports a "walking stick mast" with a sizeable luff tube to clean up the air flow, developed by Rick Le Plastrier. Amazingly advanced for the time, this predates the Windsurfer rig by about 20 years. They had trouble depowering this rig so it fell out of favor. Winged Scows: The International Moth class increased the beam around 1969/1970 so the Aussie scows adopted wings along with the rest of the class. The pics below are recent ones of the winged scow versions. The red scow in the bottom picture looks to be one of the narrow, single-chine scows that were developed in a futile attempt to keep up with the skiffs which were getting extremely narrow and faster (when the skiffs won the 1984 Australian Worlds in big breeze, this marked the end of the scow as a competitive Moth in its home country). 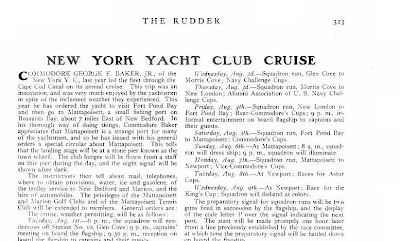 I have dragged a comment by this orange scow's former owner, Jon Reid, into the main post. "That's me in the bottom pic, bright orange boat so the rescue boat could always find me. 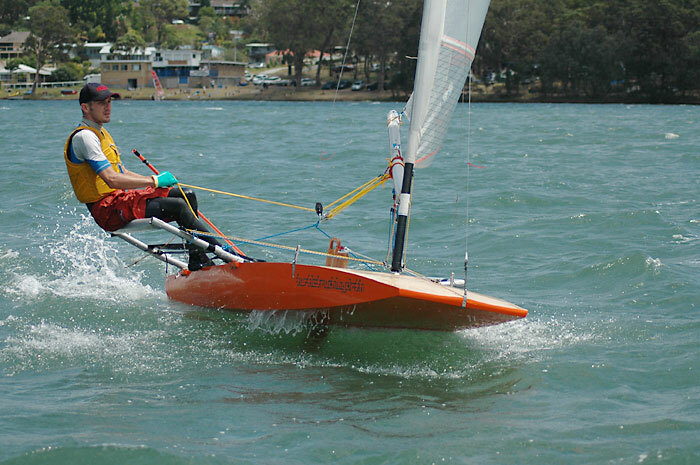 The boat was originally Learning Curve, designed and built by Bob Nicholson on Lake Macquarie north of Sydney. I did a major renovation to it in 2006 after tearing a hole in the bottom. Painted it orange and changed the name to TurtleTouchingCloth. 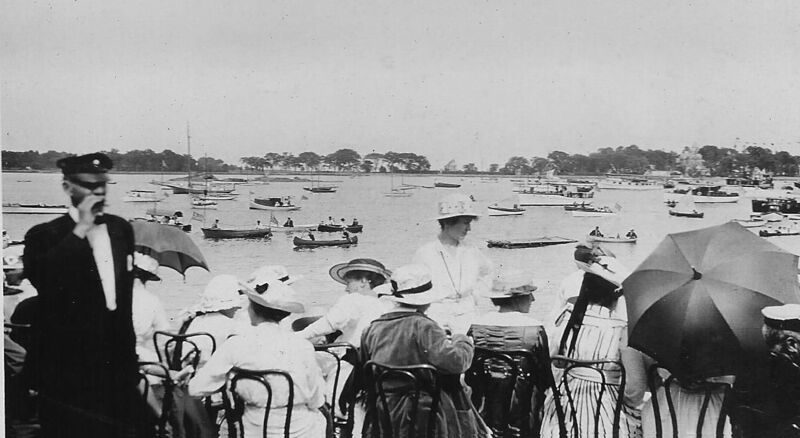 Sold it several years ago and believe it is still at the Seaforth Moth Sailing Club. God I look young in that picture." The Dutch sure have a bunch of active, competitive classes that use gaff and/or gunter rigs. The header photo featured one of them, the 16m2, the class with the smiley logo. The 16m2 (16m2 being the sail area) is about the same size and weight as our Lightning class (6 meters or 19 feet, 450kg or about 1000lbs) and the design was copied for the U.S. fiberglass Celebrity class (now defunct). It appears the class is entirely varnished wood; I can't think of another class that is entirely varnished. 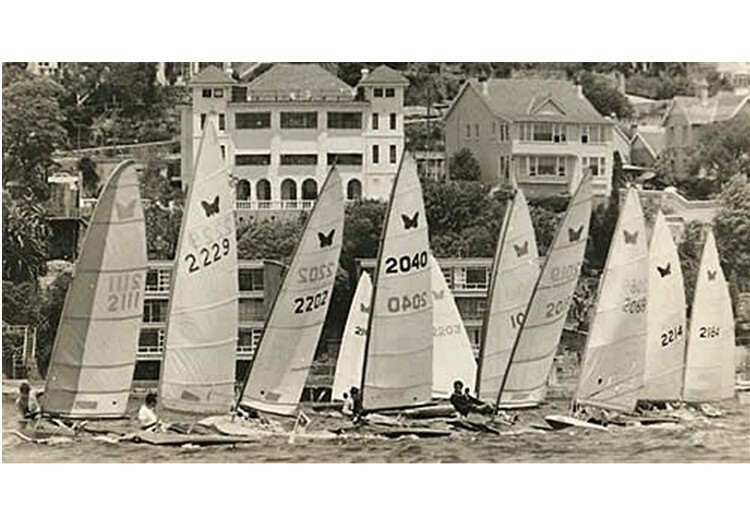 And this class is not just a bunch of "woodie" sentimentalists; it is highly competitive with upwards of 40 boats showing up for the big regattas. 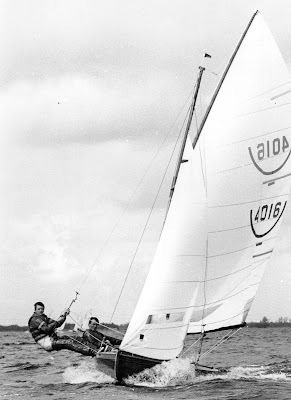 A two man crew, with one on trapeze, and no spinnaker, the 16m2 was designed in 1931 by Hendrik Bulthuis, a hairdresser from Bergum (more at Wikipedia here). "On your blog I saw a picture of a boat, what is called in Holland a 16m2 or Grote BM I was surprised to see this model in the USA, because it is a typical Dutch class I know this boat very well, because I have sailed in it for more as 16 years." A video of a finish of the 16m2 at Schildweek. Kids and Parents Sailing: Sorry! I was watching a father and young daughter, in an Academy dinghy, puttering about off SSA last night, in very light wind, and was reminded I haven't posted any kids and parents sailing videos recently. Here is short YouTube with a video bomb (in Internet parlance, a photo or a video bomb is when someone or something like a cat, dog or parakeet, unexpectedly intrudes on the shot). (For Tillerman, who gave me the word and definition of redonkulous) That kid is such a wisenheimer! [wise + German -enheimer (in such surnames as Oppenheimer)].... a smart aleck. Though I applauded Oracle's decision to go with the catamaran (one can see here, my previous posts about the America's Cup), I now think the AC72 is too big, too powerful, too fast, too scary, and too expensive. 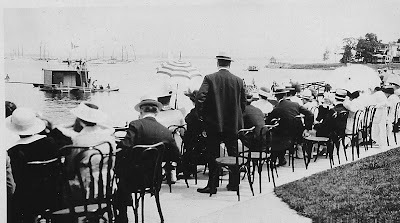 But as I said, with the America's Cup my opinion is usually wrong. I hope it is. I would like to see some great racing in very unique racing machines. "We essentially sail in a hurricane all day....."
America's Cup (No Second Place) from RAPIDLIGHT on Vimeo. 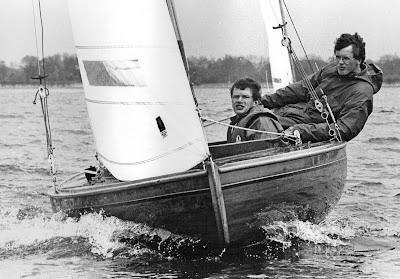 It's been some time since I posted on one of my favorite topics, small boat sailors capsizing. In the first one, an Australian Sabre dinghy sailor was gybing to get back to the line before the start, spun out, and capsized to windward (the worst kind to rescue from). Said sailor performs stellar rescue with the added benefit he ends up on the right gybe heading back to the start line. Smiles all around. In this second one, a junior sailor on a Topper (must be England) either collides with the coach boat, or the coach boat collides with him/her, net result, a rollover to leeward. Again, a TOH to this junior on a very speedy recovery.